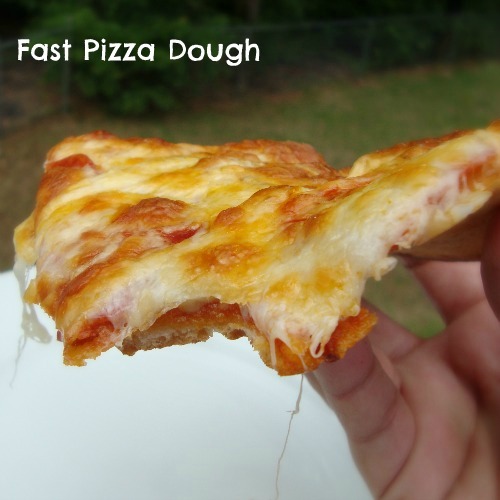 Fast Pizza Dough - Chocolate Chocolate and More! Pizza Crusts is one of those things I’ve struggled with as a bread maker. I have no idea why. That and Artisan Bread. White Bread, Wheat Bread, Rolls, Buttery Soft Pretzels, you can see, yeast and I are friends. But I’ve tried tons of pizza dough recipes and just never been happy with the end result. 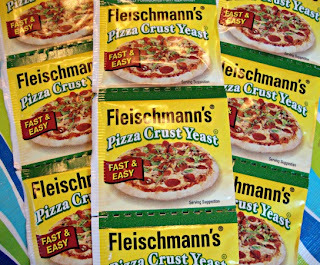 Then a few months back, I saw some chat about a new Pizza Crust yeast. I was jealous. Here’s this cool new yeast and everyone is making pizza with it while I sit at home sulking because I know it won’t be available around here for months. One of the down falls of living in small town and rural. Specialty products take their sweet time getting here. I squealed when I finally saw it at the store. And I bought a ton of it. This photo is actually from my second buying spree. I tell you for a baker, this stuff is gold. And so easy to work with. You can use a mixer or just combine by hand. I even took all the ingredients with us on our beach vacation and made fresh pizzas while there. I sent the leftover yeast home with my step daughter so she could start making pizza too. In a large bowl, combine 1 cup flour, yeast, sugar and salt. Stir with a fork, just to combine. Add water and oil, Mix until well blended, it will remind you of watery school paste. 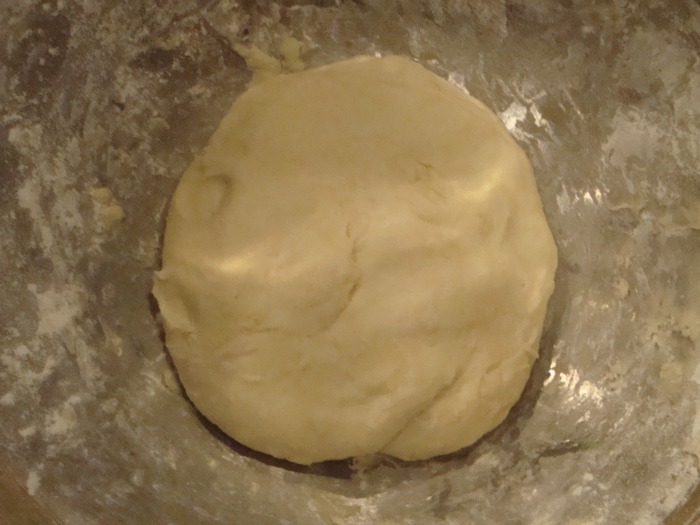 Gradually add enough of the remaining flour to form a soft dough. It will still be sticky. Knead dough with any remaining flour for about 5 minutes, working the dough back and forth. 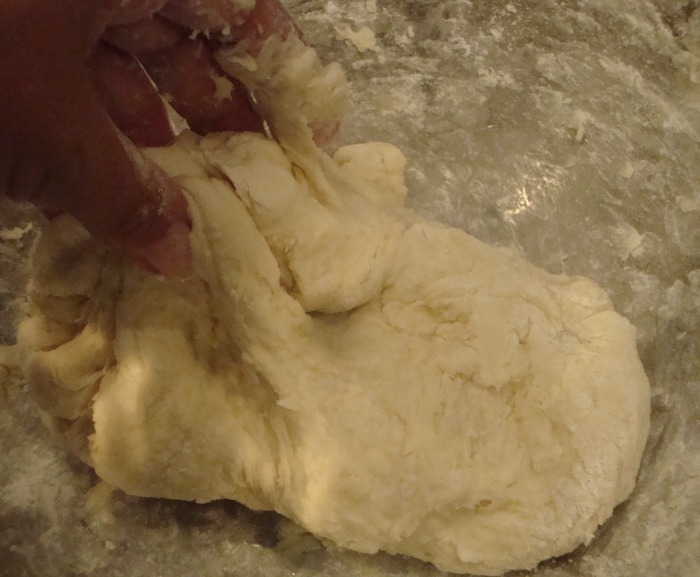 This dough is kind, you really can’t mess it up. 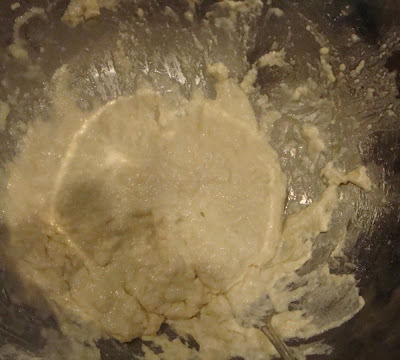 I just knead it right in the mixing bowl. Let dough rest for a minute while you prepare your baking sheet. 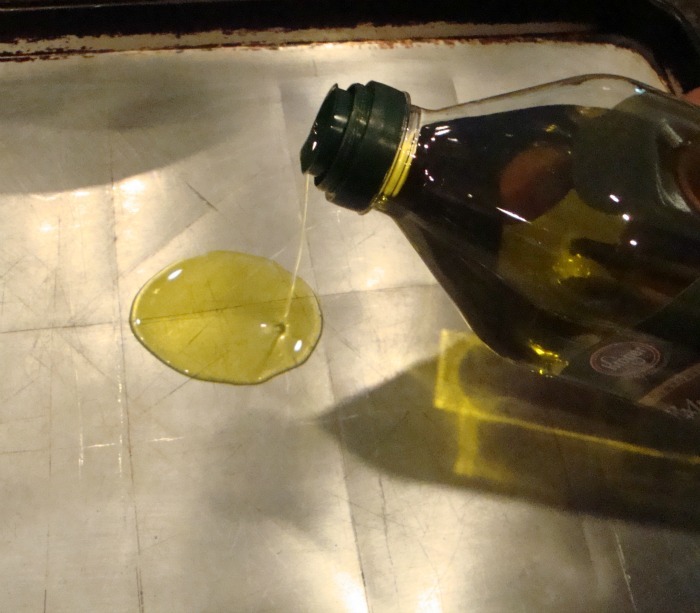 Use about 1-2 tablespoons of oil to grease your baking sheet. 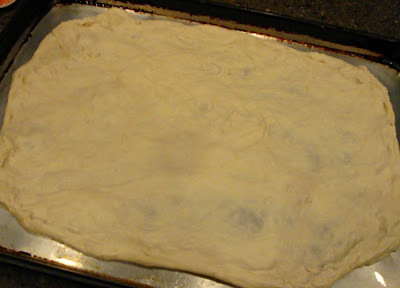 Now just start stretching your dough to fit your baking sheet. I use both hands with the dough hanging and work around the edges stretching, then when the dough is almost to the size of the baking sheet, I lay it out and finish shaping on the sheet. It doesn’t have to be perfect, it doesn’t have to be round. Now just start adding your sauce and toppings. Looking for a good sauce? This is the one we’re using, Homemade Pizza Sauce. Bake in a preheated 425 oven for 12-15 minutes. Slice and enjoy. Just look at that perfect crust. I’m linking up at some of these great parties. 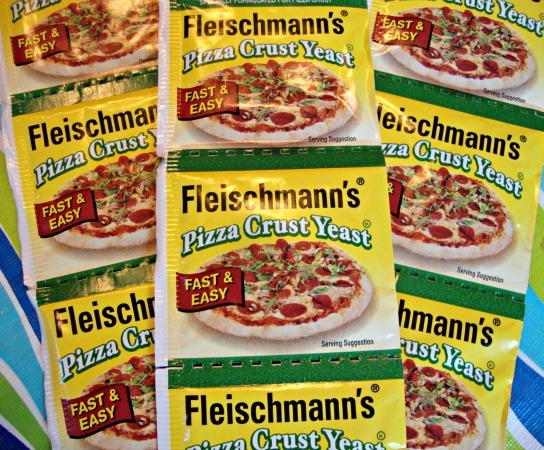 Wow, I’ve never heard of the pizza yeast. I’ll have to look for it. I have a pizza dough recipe that I love, but it does take several hours, so I’ll have to get some of this for last-minute pizza cravings! How cool! 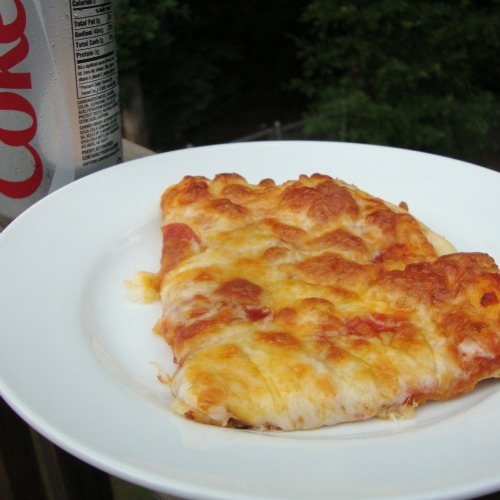 I hadn’t heard of pizza yeast–I have a pizza crust recipe I adore, but this looks really easy and delicious! Amazing!!! I’ve been struggling with this same thing, thanks for sharing!! My mouth is watering! I am visiting form the Catch a Glimpse link up and wanted to stop by and say hi. I a a new follower. I blog over at http://www.garagesalesrus.blogspot.com/ I hope you will stop by and do the same. I also have a giveaway with a Circut Machine going on right now. I would Love it if you entered but you have to hurry it ends tomorrow! Hope you have a great day! Yum! 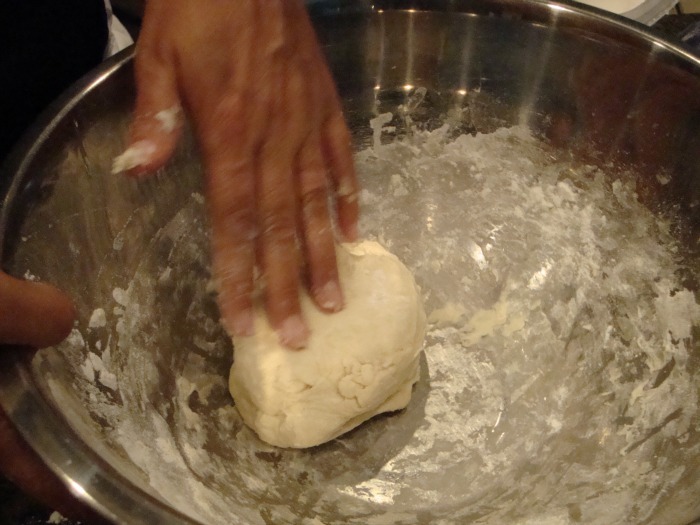 I’ve always wanted to make my own dough and just have never tried it! I so need too! This is an awesome presentation for your pizza, I almost came through the screen to have a bite. Hope you have a great week end and thank you so much for sharing with Full Plate Thursday. I have seen coupons for this before but wasn’t sure how it would work. Thank you for sharing. Now I know how to use it! 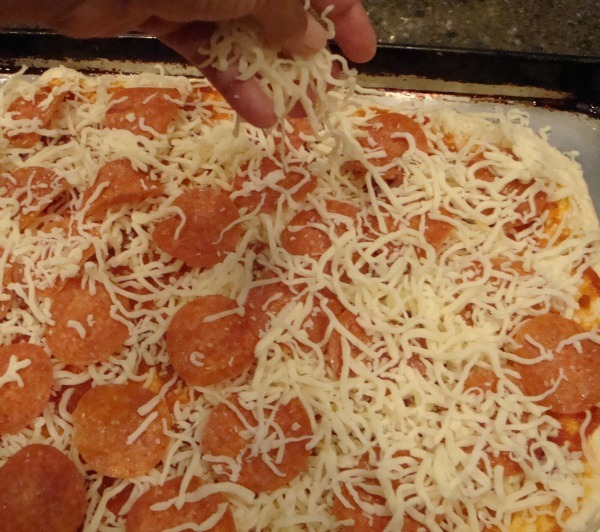 This looks so yummy, I’m on my way to the store now to get the pizza yeast! I can’t wait to try this recipe. Thanks so much for linking up each week to Creative Thursday. I appreciate YOU! The print friendly button at the bottom of the post will allow you to print. what part in the oven do you bake it, middle or lower half? I bake my Pizzas in the center of the oven. This looks great Joan! Someone shared this on FB tonight and then someone else shared it when it came up on my newsfeed – I was so happy to see your link! I’m going to look for that stuff and make us some pizza dough! That’s so cool! I use this stuff at least once a week! Crazy question but would this dough be strong enough to make mini pizza pockets? 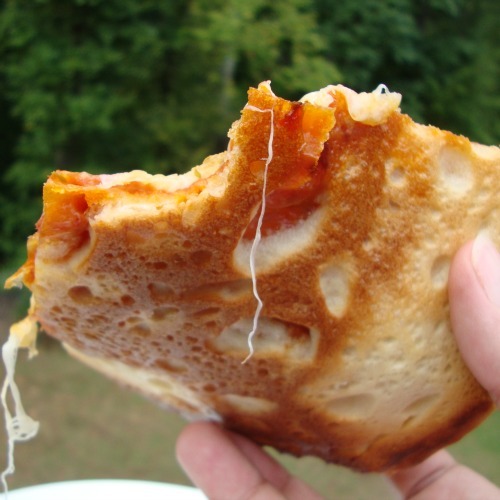 Im going to make this for pizza tonight but hope to use it for pizza pockets for my husband’s lunches. Thanks for the recipe!! Just found this recipe while looking at others. 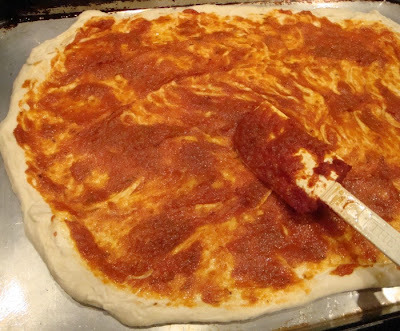 I have been using the pizza yeast for some time now and absolutely love the way it works in pizza dough. Going to try this recipe, sounds so easy, hate to wait for the raising of the dough each time. Will let you know how it turns out at high elevations. Thanks for the wonderful recipes and your dedication to helping others get better in the kitchen. Thanks Vickie! Using this blog to share recipes is just the modern day version of sharing them over the back fence.